While Siri is great at pronouncing some common names, Siri can also completely blunder on others, turning a first or last name into an almost unrecognizable mess of noises that barely resembles the way the name actually sounds. Fortunately, iOS now makes it very easy to correct Siri directly and verbally, so the next time Siri messes up you can instantly fix the pronunciation and get her to speak the right way. Or you can preempt any mistake, and with names that you anticipate Siri to mispronounce you can correct before the virtual assistant has a chance to screw it up by teaching her (or he!) the right way to say a name. 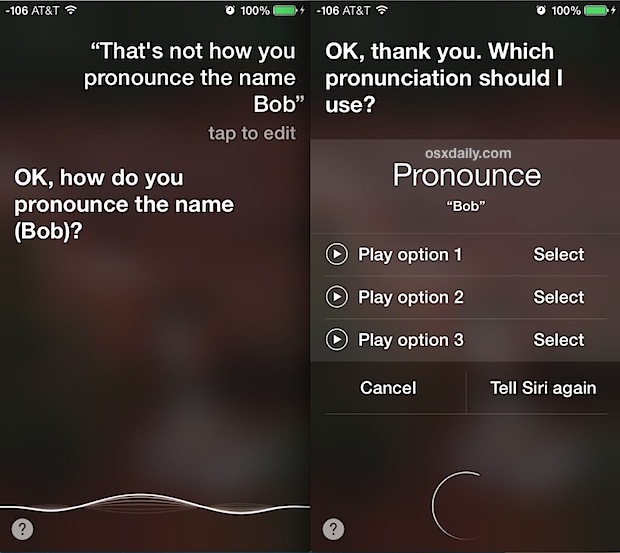 Would you rather teach Siri of the proper way to pronounce a name? If the three pronunciation examples that Siri provides are way off, tap on “Tell Siri Again” to offer the proper way again. For the most part it will offer a close-enough option in at least one of the initial three, but if Siri completely fails then tap the Tell Again option and annunciate each distinct syllable a bit closer. Repeat this as necessary for names that Siri is mispronouncing, and you can also choose to correct either the first name and last name, or go all in one and correct the entire names pronunciation if the assistant is butchering the whole thing. Fixing the pronunciation is also important for improved name recognition for contacts with defined relationships, and just natural language commands in general. This works the same on the iPad and iPhone, so long as the device as Siri support and at least iOS 7.0 or newer. Prior to iOS 7, users had to go about adding the phonetic spelling of a name to fix (or at least improve) how Siri pronounced names. The phonetic spelling trick continues to work, and if the verbal pronunciation correction doesn’t fix how she/he speaks the name, it may still be the only option. Never works though! Have used it for Finnish friends names. It asks me, I select accordingly, then next time when I say “call xxxxx” it doesn’t recognise the name and I go through the process all over again!